I am a multidisciplinary artist whose practice encompasses assemblage sculpture, collage, and video. My process begins with, and is informed by, an extensive collection of children's toys, decorative objects, craft materials; and, dried gourds. Courting chance, I seek out discoveries of discarded objects found in isolation from their mass-produced clones. This activity’s symbolic alignment with environmental concerns only became obvious as my work progressed, deepening my attraction to plastics. While they are often altered to the point of unfamiliarity, the brightly colored plastic toys lend themselves to the playful and inquiring way I assemble sculptures. Gourds have become my cardinal medium. They are prehistoric entities, dried specimens having been found intact at archeological sites dating back to 13,000 BC and are likely the first domesticated plant species. Though they are inedible, they have long been manipulated for use as vessels, utensils, and instruments. I adorn dried gourds with found, machine-made objects, fusing the "natural" and artificial. This, along with the suggestion of sexual organs of both humans and plants within the sculptures, point towards a kind of queer animism. 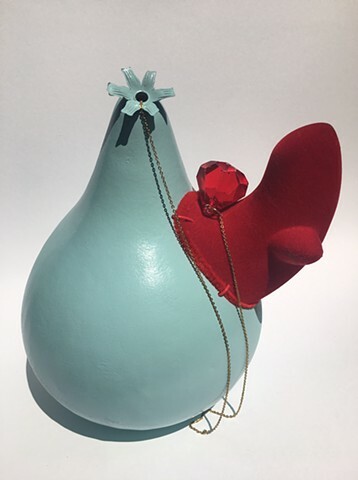 Using the gourd as figure or canvas, attention is constellated in the most minuscule, synchronistic moments when these disparate elements happen to fit together seamlessly. Beyond the physical materials, a love for literature—namely surrealist and magical realist fiction—influences my work. Imbedded within each sculpture are puns, double entendres, and plays with doubling.